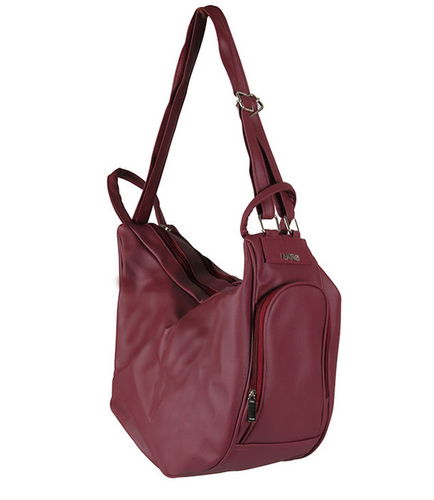 A handbag or a backpack , its your choice , a convertible bag in a happy maroon, with pockets in front and a roomy interior. By the time you take your decision to purchase (approx 5 minutes), globally over 10,000 animals would have been brutally slaughtered for their skin! Merci is a great alternative to leather, offering high quality trendy products at a great price with quick delivery. We are a group of volunteers with a mission to build India’s first social brand having pledged to redeploy 100% of profits towards HEAL i.e. Health, Education, Environment, Animal Welfare & Livelihood. When you buy this product, you will have an unknown soul blessing you for your thoughtful choice. Merci monsieur, for choosing Compassion through Fashion!